Written by Dan Mazeau, David Johnson, Greg Berlanti (based on characters from Beverley Cross' original Clash Of The Titans screenplay). 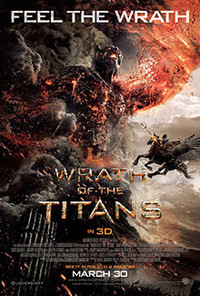 Firstly it never occurred to me that they'd actually make a sequel to the remake of Clash Of The Titans, and secondly, what a nice surprise to see that South African-born director Jonathan Liebesman was picked to helm this special FX spectacular. After saving the world from the destructive titans, Perseus (the son of Zeus) has settled down again to his life as regular fisherman, raising his son. But, when his father is captured by his uncle Hades and his son Ares, he has to take up his sword again and thwart an even bigger threat rising from the depths of the earth's core. Alliances get forged and the quest is on (with a range of wild beast and creatures in their way). Devotees of the original Clash Of Titans will enjoy a little nod to this early-'80s classic.